He is known for a daredevil attitude and risk-taking many wouldn’t dare dream of. And now, Danny MacAskill has added another feat to his impressive CV of stunts, ticking off an iconic bridge in Lochaber and paying homage to one of his childhood heroes in the process. The stunning shot at Glencoe, captured by photographer Dave Mackison, has been shared far and wide on social media. Pro rider Danny MacAskill said: “We went up to Kinlochleven, which one of my favourite places for mountain biking in Scotland, to film some shots for one of my sponsors Santa Cruz bikes. “We had a great time riding some of the trails that make up some of the sections of the Scottish Six Days Trial motorbiking event in Lochaber and at the end of the day, we decided we would get the shot. 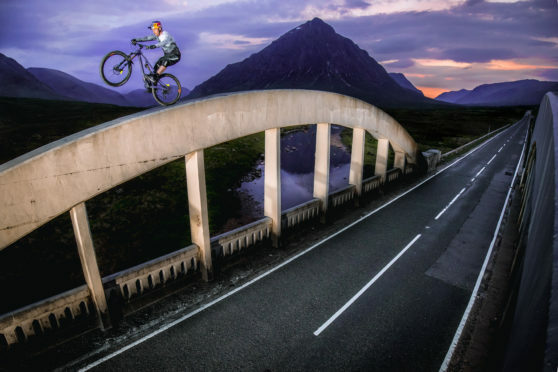 “Anyone going through Glencoe knows the two bridges and one of my heroes had done a photo in one of my favourite mountain biking magazines so we had good fun trying to recreate it while the roads were quiet. “To me, there is very little risk. That was more photo shoot stuff. It is not my most spectacular stunt and it is hard to get up on one side but it was great to pay homage to Martyn Ashton. The famed stunt cyclist is currently recovering from a minor operation to have cartilage removed from a previous injury to his kneecap. He hopes to be back on the bike in the coming weeks with exciting plans laying ahead for 2019. He added: “At the moment I am just focusing on my recovery. Last year wasn’t the most productive but I am pretty excited for 2019 as I have a few projects lined up. Photographer Dave Mackison said: “I am always pretty excited to shoot something different so for Danny to put himself in danger a wee bit is cool and to shoot it from different angles was great.